With a coffee in hand, along with my suitcase, book bag, handbag and guide dog I soon found the mobility assistance within London Euston Railway station. My assistance had been pre-booked so at just after 22:00 i was guided to my train. The man assisting me happily took my case and my book bag and off we went. 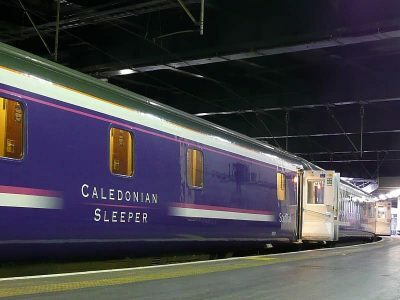 It was a very different ‘check-in’ for The Caladonian Sleeper. It reminded me more of checking in to a flight. First I checked in and was informed by the staff that I would be upgraded to a berth, they allocated me the ‘accessibile berth’ so that I was directly beside the toilet and just a door away from the lounge car. The train measured over a quarter of a mile long and I was towards the furthest end. This is because the train that leaves Euston travels towards Scotland as one train, before splitting; with one part going towards Edinburgh and the other part towards Glasgow. Once onboard the train, my room wasn’t quite ready, so I was seated in the lounge car where I was able to enjoy reading the extensive whiskey menu before I settled for a glass of red wine; before making myself and Fizz comfortable for the night in our berth. The bed was comfortable, I took the extra pillows off the top bunk and although I looked at the little ‘sleep pack’ that was sat on the bed, I chose not to make use of the eye mask or ear plugs. 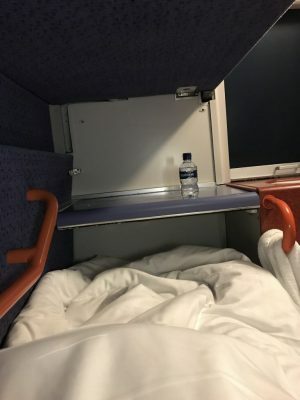 For my first ever sleeper journey I wanted to be as aware of my surroundings as possible. 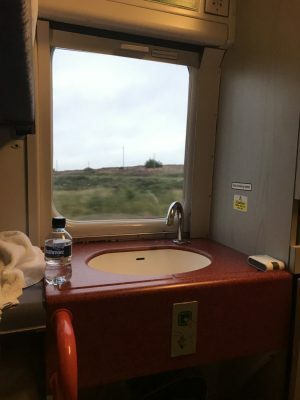 I plugged my phone and watch in the USB ports, worked out which switch was for the main light and the bed light; popped to the loo again for one last time and tucked in to bed to listen to my audio book all before the train had even left the station. This was a school girl error as I suddenly felt very aware and awake when the train did start moving. 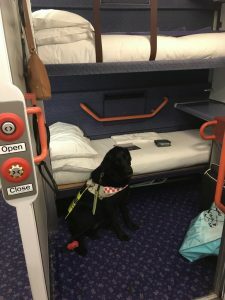 Especially at the beginning when we were stopping at other London stations (just like a normal train would) so it was not until we were clear of London that I found myself getting comfortable again and drifting off to sleep. I remember waking several times throughout the night, but there was not a clear reason for it. It wasn’t until I awoke in a panic when the train seemed to ‘turn off’ that I got a reasonable nights sleep. My panic awakening was because I felt that we must surely have arrived in Glasgow, although upon reaching my phone I realised I was over an hour early for the arrival time of Glasgow, let alone for the extra thirty minutes I had to vacate my room once we did arrive. So I took the time to get dressed and raise the blind in my room to let the Scottish scenery in. I even made myself a Herbalife shake for breakfast and got packed up. 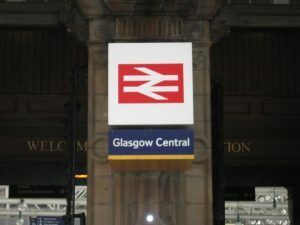 It wasn’t long before we pulled into Glasgow Central Station and the kind staff gave me a bottle of apple juice and informed me that my requested station assistance was ready to guide me from the train to the exit of the station. It was lovely to walk into a quiet station (being 7:10 on a Tuesday morning). The rail assistance asked me where I was heading and asked if I needed help getting a taxi, I politely informed him that I was going to head to my hotel to drop off my case and enable Fizz to stretch her paws along The River Clyde. Because thanks to more support on social media and google maps I knew all I had to do was walk toward the river and then along it for 19 minutes to reach my base for the next day and a half. The Glasgow Crowne Plaza.